I've spent the past three days struggling to calibrate the gauges on our black and gray water tanks. The boats come with tank monitoring "gauges" as standard equipment, but they leave a lot to be desired. We have similar gauges on our Grand Banks, and the problem is that there isn't enough granularity to the readings to know where things really stand. The issue is that there are just 4 lights to tell you tank status. Orange - Orange comes on at about the half full point. Red - Red is the unhappy light and means you are in deep dodo. On some systems, the toilets automatically disable when the red comes on. Because Green only means the tank is completely empty, and Red only means the tank is completely full, in practice there really are only two useful indicators; Yellow means you are somewhere below half full, and orange means you are somewhere above half full. It would really be nice to know with a little more accuracy where things really are. On the Grand Banks, I lift a hatch and back-light the translucent tank with a flashlight and you can see where the level is. But this is what we have gauges for - at least we should. Sooooo, when building the boat we installed ultrasonic level sensors in the black and gray tanks. That seems simple enough, but when I hooked them up, I was getting erratic readings. It would go up and go down all over the place, basically reading everything except the correct level. Reverting to the installation manual, there are a number of cautionary notes warning against the use of silicon sealant or cork gaskets. It says to only use the supplied gasket. Now I can't for the life of me understand why the type of gasket would impact the sender, but for kicks I removed one and sure enough, it was gooped up with some sort of magic goo. After scraping and peeling it all away, guess what? The sender worked perfectly. Wow, I'm dying to know why this is and have asked the manufacturer. Stay tuned for the answer. Or maybe one of our readers knows? With the sender finally working, the process of calibration begins. The process involves pumping the tank all the way down, then filling it in measured increments until full, and taking depth measurements at each increment. These depth/fill quantities are then given to the sender which is then smart enough to report back the level in gallons or liters rather than the physical level. This is really important with irregular shaped tanks, which mine are. One side of each follows the curve of the hull, so 6" of water at the bottom of the tank where it is very narrow represents much less water than 6" at the top of the tank where it is very wide. With these smart senders you just give them a bunch of measurement points (the more the better) and it translates every inch of level into gallons of whatever. Now somewhere along the way here you must be wondering how unpleasant a job this must be, right? Gray water sounds pretty gross, right? And black water is down right disgusting. Nope. That's the beauty of a new boat. There is nothing but water in any of these tanks and I can freely fill them and pump is back overboard without any problem. Even my measuring stick comes out clean. But you can see that there is a lot of incentive to do this now and be sure that I have it right, 'cause I sure don't want to have to do it again. OK, with that out of the way, let's get on with calibrating. In the picture below you can see the tank top. The round black thing to the left partly under the black cable is the sender. 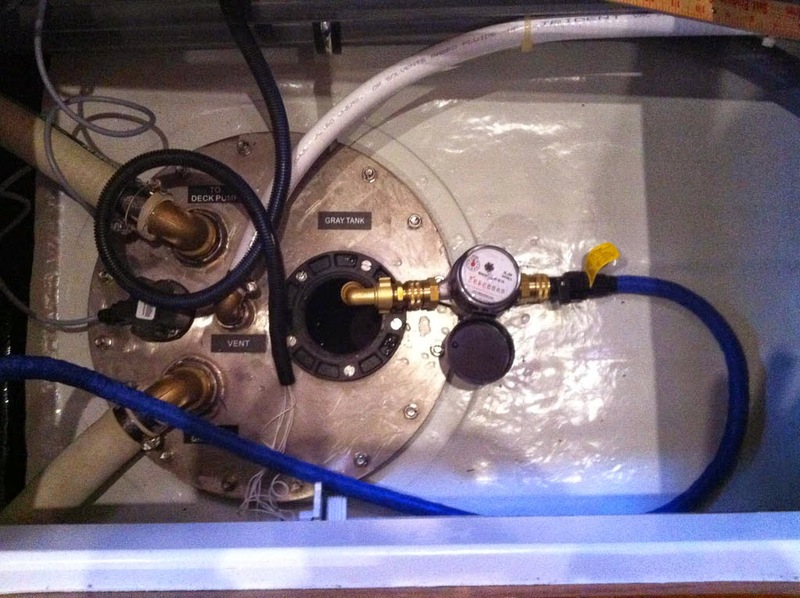 To the right you can see the blue water hose and the water meter with it's outlet aimed down a larger black opening. The key here is the water meter. It cost $80, but is a calibrated, commercial quality meter. Starting with an empty tank, I filled it in 20 gal increments as measured by the meter. After each 20 gal I used two conjoined yard sticks to measure the water level, carefully recording everything. Then just keep adding another 20 gal until the tank is full. Tank top, black sender on the left under black cable, water meter attached to blue hose. What's full, you might ask? Good question. The tank is specified as 120 gal. But the red panic light comes on when the fluid level is about 4" below the tank top. Well, these tanks hold a lot more than 120 gal. It took 170 gal to light the red light. Another consideration is that the sounder has a 6" "deadband", which means that it is blind closer than 6". So it will consider everything closer than 6" to the top as Full. At the end of the day, I decided to calibrate for the rated 120 gal, which is about a foot below the tank top. That will minimize how much sloshing hits the sender and hopefully limit fouling. It also gives a significant margin in case I ever need to add a little more to the tank before pumping out. After filling the tank, noting all the dip stick measurements, and finally feeding the calibration info into the sender, I tested it by running the pump-out to empty the tank and watch the level drop as reported by the sender. Everything worked correctly. Between trying to get the sender to work, including one complete tank fill end empty cycle that was wasted because the sender was not working, and the final successful calibration, it took two full days to get the gray water tank done. The black water then only took a half day, including chasing out one of the screw holes which was galling a bit. If you have used stainless nuts and bolts much, I'm sure you have experience galling which is the spontaneous self-welding of threaded stainless parts. If you have burs or other binding of threads, watch out. One of the sender screws nearly seized coming out, so I had to get a tap and clear the threads in the tank top, and get a new screw before putting the sender back in. Nothing that can't be solved by the 5,352nd trip to the hardware store. That's two tanks down and 5 more to go (4 fuel and 1 water). 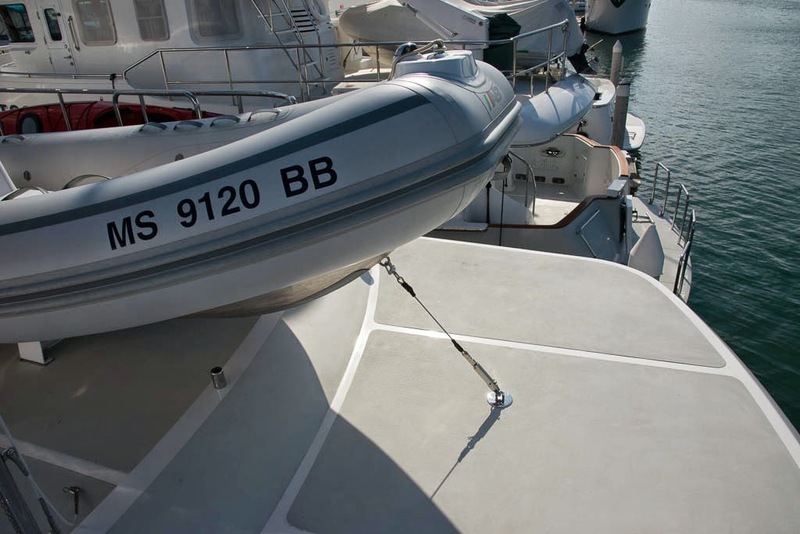 One of the larger projects has been getting the dinghy positioned and mounted on the boat deck. The first step is to use the davit (crane) to lift the boat out of the water and up onto the boat deck. Then the chocks that I had made last winter (and that cradled the dinghy across the country) get set up in their approximate position on the boat deck, and the dinghy lowered into them. There there is lots a shoving and moving things about to first get the chocks positioned and lined up correctly against the bottom of the dinghy. Remember, the dinghy has an ever changing shape to it's hull, so the chocks only match up in one spot. With the chocks properly registered against the hull, the whole assembly of dinghy and chocks gets shoved and slid around the boat deck to find the best position. We have it pushed back with the bow hanging out over the boat deck extension. This frees up a lot of space between the dinghy and the pilot house making movement around the deck much easier than on other boats I've been on. We also have the dinghy facing aft. It that way when you pick it up and swing it around to the port side of the boat to launch it, it's facing forward. We have struggled with launch and retrieval on our Grand Banks where the dinghy is stern forward in the water and it's a real pain in the rear (pun intended). I think this will be a lot easier. Another thing we have done a bit differently is that we have set up the davit so that it parks pointing aft. All the other 55/60s that I've seen have it park pointing forward, and the boom seriously blocks movement around the boat deck. By pointing it aft we completely open the deck to walking traffic, and the boom isn't going to get in anybody's way pointing aft. Once the dinghy is all positioned, aligned so it is square to the boat deck, it gets bolted down. Then, in addition, there are three tie downs to keep it from getting away. Lots of space with davit pointing aft. Most people know that LED lights are much more efficient than incandescents, but I don't think most realize just how significant a difference it makes. One of my projects over the past week has been to switch out all the light bulbs on the boat for LED bulbs. We considered having the boat equipped with LED lights at the factory, but it was going to cost an extra $10,000. In contrast, swapping the bulbs has cost about $1800, and that's for well over 100 bulbs - probably closer to 120. The time involved in making the change was about a day and a half. Some bulbs were easy to change, and others required disassembling fixtures in hard to reach places. 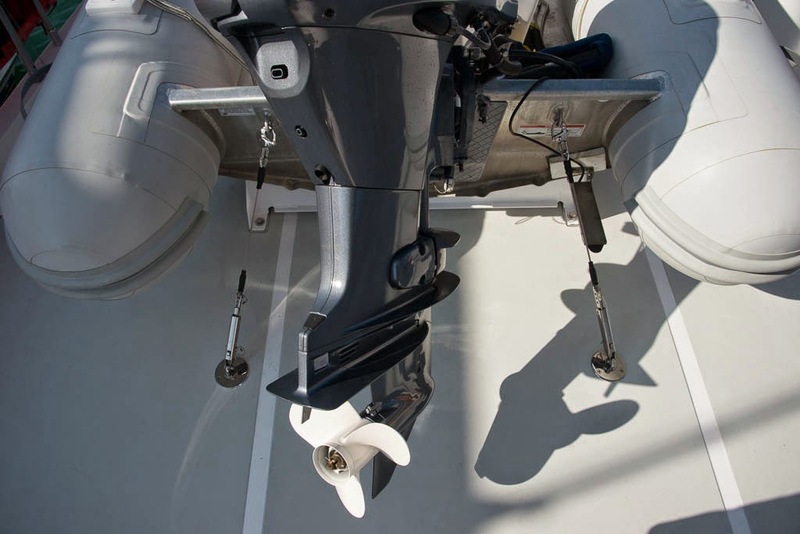 Speaking of fixtures, there are 6 different types of fixtures on the boat. Ceiling spot lights - There are probably a dozen of these. And this does not include various florscent lights in the engine room, lazarette, and bathrooms. Those I am leaving along for now since they are already a lot more efficient that incandecents. For those 7 different styles of fixture, 4 different types of bulbs were required. All the bulbs being replaced were 20W each, and the replacement LEDs are all 2W each. That's a whopping 10x reduction in power. With a "bunch of lights" turned on the boat was initially drawing 25-30A at the panel. Now it's around 3 with the house lit up like a Christmas tree. This not only makes a huge dent in the battery drain while at anchor, and subsequent generator time to recharge, but it also greatly reduces the air conditioning heat load. All those incandescent lights were kicking off about 2500 BTU/hr of extra heat. When you consider that a small room air conditioner is about 5000 BTU/hr, you can get a feel for how much extra heat they created. I highly recommend this enhancement on any boat, especially those that spend any appreciable time at anchor. Making the change involves taking a careful inventory of all the light fixtures in the boat, and opening up one of each type to sort out exactly what type of bulb you will need. I used warm white LEDs through out to better match the feel of the original lights. There are roughly three part to the commissioning process. Testing everything to be sure the boat has been built as specified, includes everything it is supposed to, and that everything works correctly. PAE has a long checklist that they go through together with the build contract to check against. They completed their checklist about a week ago, and although there are a hand full of issues that are still being fixed as a result of that process, we have a boat with a solid baseline to work from. 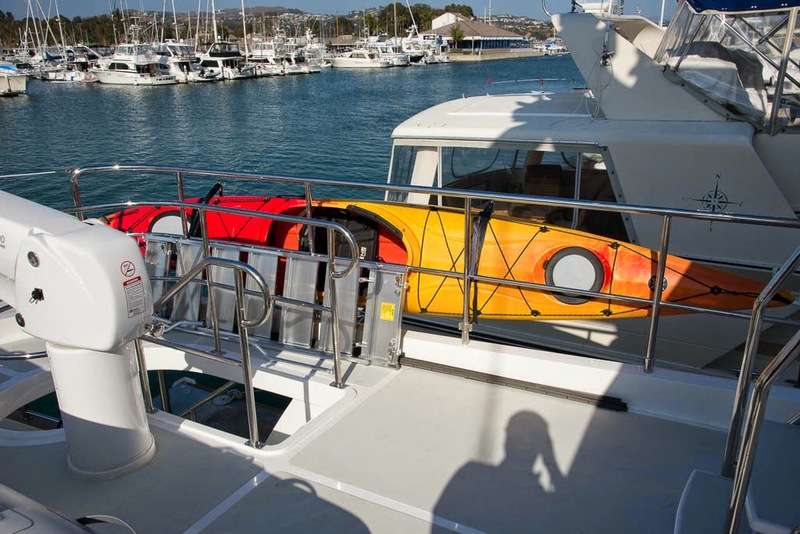 Outfitting the boat with additional equipment beyond what was built at the factory. By far the biggest item in this category is the electronics. A significant portion of the electronics on our boat were pre-installed at the factory, but there is still a lot of work to hook everything up, add additional equipment, and get everything set up and working correctly. This part alone is a 4 week process. We are about 10 days into it and have most all of the navigation gear up and running at this time. Still to be added are a number of monitoring systems, computers, and AV systems. Additional "outfitting" includes mounting the dinghy, mounting the life raft, tinting windows, making canvas, making and installing window shades, making mattresses, installing carpet, installing our dive compressor, mounting dive tanks, and figuring out where and how to store all our stuff. The list is endless. In fact, if you have ever owned a boat, you know that it really is endless. 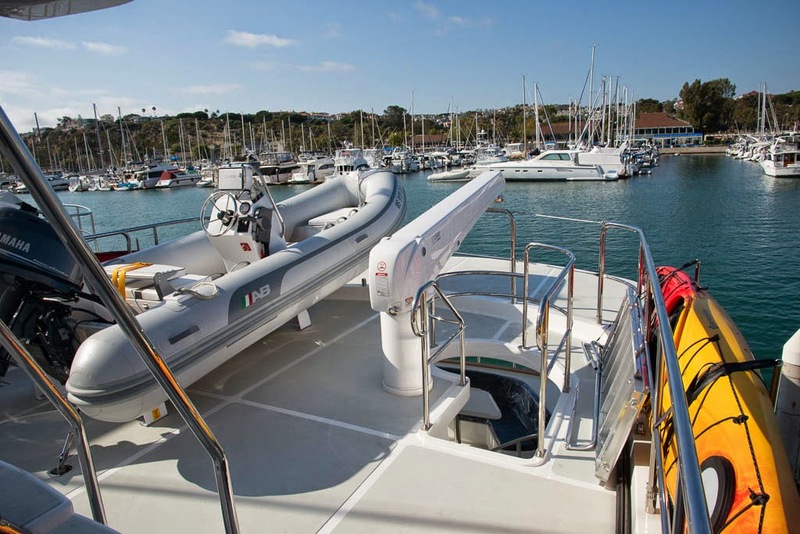 You are ALWAYS outfitting your boat, and how much you try to do as part of the whole commissioning process will directly effect how long it takes. 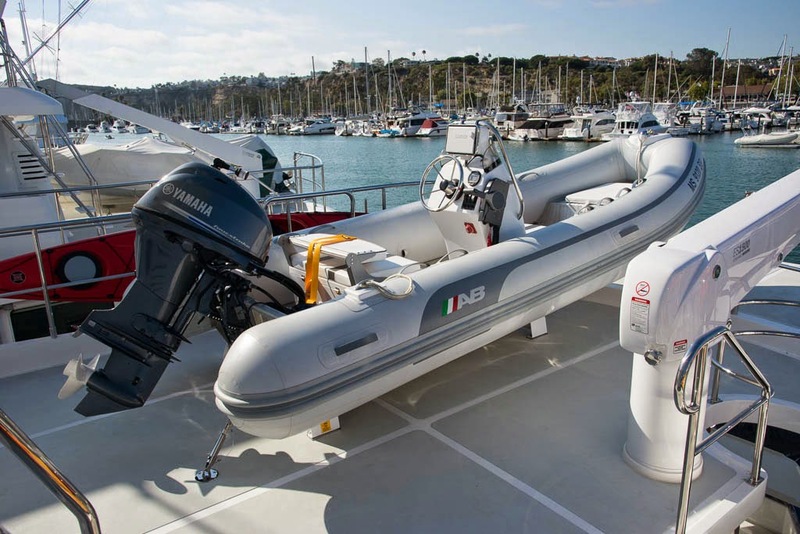 We are trying to be really careful to only include the essentials for a safe and functional boat, and save much of the fine tuning for the ensuing months and year(s). One really good piece of advice I heard is to use you boat for a while before you decide on all the things you need. In real use you will likely find you don't need a lot of things you though you did, and will really need things you never though you would. Remember, outfitting never ends, so if you don't draw a clear line, commissioning will never end either. The last category is to get out and use the boat and everything on it. These is a staggering amount of equipment on a cruising boat, and it all needs to be tested, exercised and pushed. The goal is to shake out the problems as early as possible so they can be fixed. Problems are to be expected. If you aren't finding any, you probably aren't testing enough. Find them early, find them fast. Once you get through them all, you will have a solid and reliable boat.